awesome to see where your imaginations and creativity take each of you. It was also fun to read about the stories and process behind each one. Thanks so much for your beautiful entries. Congratulations, Lucy. I loved all of the little details on your doll. 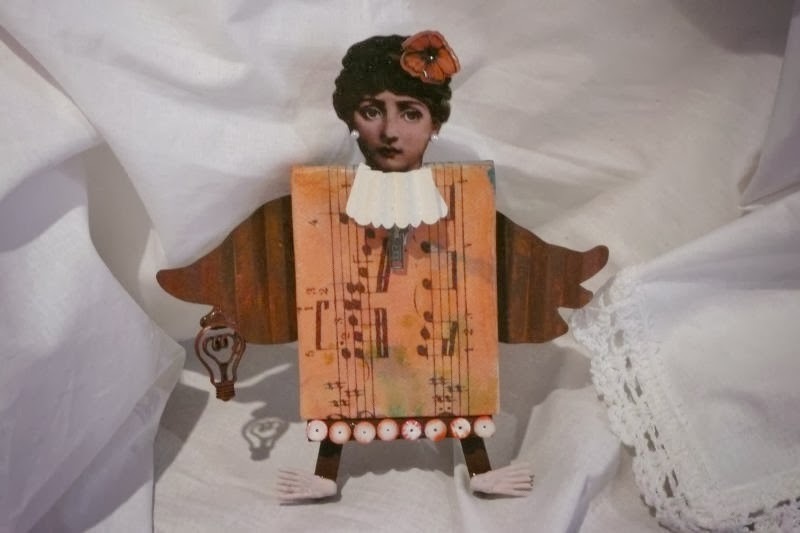 Her beautiful face and rusted wings, the zipper pull, shrink plastic flower, pearl earrings, and light bulb to light the mad caroler's way all made me smile. And those skellie feet...so fun! Lucy, please contact Kim at kim@eclecticpaperie.com to claim your $15 gift certificate prize and your winner's badge. You will be the first to display the badge on your blog since it's brand spankin' new. Be sure to check out the new eTeam Picks Challenge this week hosted by the lovely and talented Tracy. She has chosen the theme of Recycled...something everyone can play along with. Hope to see your creation there! Oh wow, thank you so much, Bonnie, I am so thrilled! Glad I rushed to make it now! She has just got in from her carol singing and is sitting on the mantelpiece getting warm now! Yay Lucy, I saw your dolly on your blog, congratulations to you!